It is a convenient and speedy way to place the active window into a predetermined position and size on screen. When working with multiple open windows, you often need to drag them around the desktop to put them into optimal locations. Wingrid can help by automating the relocation. The screen is notionally divided into 4 equally sized invisible rectangles in a 2x2 grid. Via a key press, the active window is moved within the grid. Each window may occupy any 1, any 2 adjacent, or all 4 rectangles. You can choose whether the window is to be at the top, bottom, left, or right of the screen, or maximized. You can also change the position and size of any window at any time. This flexibility enables you to put multiple windows into a layout that suits your way of working. It is easy to have one layout for your current task and a different one when you switch to your next task. The window to be acted upon is always the active window. It is sometimes known as the window that has the focus. Placing the window into the grid is done by a combined key press, i.e. 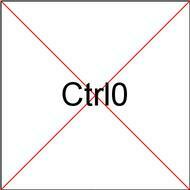 the control key (Ctrl) and a number key (1-9). Each number key represents a different placement within the grid as shown in the following diagram. You can control Wingrid by changing its settings. In any layout in which windows are stacked vertically, they might be slightly misaligned and produce overlap. This can be corrected by increasing/reducing the height of the windows in wingrid.conf. Adjustments are usually set-and-forget. Once they have been done to your satisfaction, they will work for all window layouts that Wingrid stacks vertically. The method uses two windows stacked vertically via Ctrl3 and Ctrl4 respectively. Repeat the adjustment process using refined values if neccessary until the windows abut correctly. The assignment of a combined keypress is handled by the window manager. In your antiX system this will often be one of the following Fluxbox, IceWM, or JWM. Each of them assigns combined keystrokes in its own way. Changing assignments is best done after referring to the user manual of the your chosen window manager.